Avocet Mining PLC is a junior gold producer and explorer listed on the AIM Exchange in London. Annual production for the financial year ending March 2003 was 134,580 ounces of gold. The Company has a combined resource base of 5.2 million ounces of gold, of which 1.2 million ounces are in the current mine plan (Avocet, 2003). The Company’s goal is to produce 300,000 ounces of gold per annum by 2006. Given this challenge, it is no surprise that exploration is focussed on near-mine and short-term development projects. Only a small portion of the exploration budget is directed toward district and regional exploration. This paper outlines the geological controls on mineralisation for each project, describes the exploration procedures implemented, and summarises the status of the Company’s development projects. Many of the preliminary facts are assumed or mentioned only briefly in order to document project-specific issues thoroughly. The Penjom Gold Mine is located in central Peninsular Malaysia. Avocet has produced over 550,000 ounces since mining commenced in 1996. The current measured and indicated in situ mineral resource is 2.39Mt @ 5.2 gpt Au (0.40Moz Au). Inferred resources add a further 1.62Mt @ 4.2 gpt Au (0.22Moz Au). Combined reserves, including stockpiles, are 2.67Mt @ 5.0 gpt Au (0.43Moz Au) (Avocet, 2003). Mineralisation is open at depth and the Company is evaluating underground mining options. Potential for satellite deposits along strike remains, but is limited by the restrictive land situation in Peninsular Malaysia (figure 1). Peninsular Malaysia consists of three main geological domains striking parallel to the peninsula. Yeap (1993) defines these as the Western Tin Belt, Central Gold Belt and Eastern Tin Belt after Scrivenor (1928). The Central Gold Belt hosts the majority of Peninsular Malaysia’s gold occurrences, including the Raub Australian and Penjom gold mines. This is the belt of primary, but not exclusive, interest. The Central Gold Belt consists of a Permo-Triassic continental shelf (fore-arc) sequence intruded by early Jurassic granite-syenite composite plutons and later diorite dykes and stocks. This is a deeply eroded fold and thrust belt formed during the late Triassic collision of Indochina (Cathaysia) with the western Sibumasu Terrane (Gondwana) (Metcalfe, 1988, 2000, 2002). The latter is represented by rocks of the Western Tin Belt. This includes Siluro-Devonian deep marine sedimentary rocks of Tethyan origin and Triassic Sn-W granite batholiths (e.g., Main Range Batholith). The Raub-Bentong Suture marks the collision zone between the two terranes (Hutchison, 1975; Metcalfe, 2000; Tjia, 1989) (figure 1). This is a zone of melange up to 20km wide, incorporating tectonised metasedimentary rocks and mafic-ultramafic intrusions. Tan (1996) cites several factors refuting the collision origin of the Suture (e.g., no defined ophiolitic sequences), but does not offer an alternative interpretation. Figure 1: Map of Peninsular Malaysia showing the metallogenic belts, Raub-Bentong Suture (RBS), mineral occurrences and location of Penjom. The Raub-Bentong Suture has accommodated considerable strike-slip movement (ref). This has resulted in numerous splays running along the Central Gold Belt. The Penjom Gold Mine is located along one of the more significant splays (Davies, 2000). It is situated within a sequence of Permian terrigenous, volcaniclastic and carbonate sedimentary rocks of the Raub Group. These lie near the western margin of similar Triassic rocks (Lipis Group). An incised lateritic profile up to 20 metres thick covers much of Peninsular Malaysia. This obscures much of the geology and is responsible for the many alluvial gold occurrences that have confused explorers in the past. A diverse sequence of well-bedded tuffaceous siltstone and sandstone (of both dacitic and andesitic provenance), pebble conglomerate, carbonaceous shale, calcareous shale-sandstone and minor limestone dominates the mine stratigraphy. These belong to the Permian Padang Tengku Formation of the Raub Group (Richardson, 1939; Lim et al, 2001). The stratigraphy strikes NS and dips to the east on a regional scale, but within the mine area it has an EW-strike and southerly dip. The Penjom Thrust is the dominant feature controlling the distribution of ore in the Kalampong and Manik pits (figure 2 - mine geology). This strikes NE (035°) and dips to the southeast (30-40°). It is a westward-directed thrust that appears to have broached an asymmetric fold, rather than caused the folding itself, as interpreted by Fillis (2000) and Lim et al (2001). The fold axis is subparallel and beneath the thrust, such that the footwall strata are folded and dip into the thrust and the hangingwall sequence is tilted. Considerable shear stresses along the Penjom Thrust have remobilised much of the carbon within the shale sequence to form a graphitic “alteration” zone. This, together with sheared and milled rock, makes the Penjom Thrust an impermeable horizon (Lim et al, 2001). Perhaps the most significant unit in the mine area is the tonalite intrusion complex. This is a series of competent, narrow sills (typically less than 5 metres thick) that are folded along with the host stratigraphy. They also have minimal thermal aureoles and chilled margins (< 20 cm). These observations suggest that the tonalitic magma intruded under near-equilibrium conditions (400°C at 5-10km depth) prior to the peak structural deformation event (Bogie, 2002). Corridors of subvertical to steeply east-dipping NS-striking normal faults and later NW-striking faults transect the geology. These have minimal throws (< 20 m) and are difficult to trace beyond the mine area. There is some strike-slip movement on the Penjom Thrust that is probably related to the later faulting event. Quartz-sericite-chlorite (phyllic) alteration of the tonalite sills post-dated intrusion. K/Ar dating of sericite separates yielded stable ages of 194-191Ma (Bogie, 2002). Phyllic alteration of the sedimentary strata is only observed in turbiditic sequences with a dacitic or rhyodacitic provenance because the carbonate in the rest of the sequence buffers phyllic fluids. § fracture-hosted veins becoming stockwork in and on the contact of tonalite intrusions. Favourable settings for high-grade veins are the contact between tonalite and sedimentary rocks, especially where the latter are carbonaceous and/or the strata are tightly folded or intensely faulted. Fillis (2000) highlights fold noses as particularly well-mineralised sites. Competency contrasts and the chemical activity of carbon are prime factors in focussing gold mineralisation (Lim et al, 2001). Sulphides present include arsenopyrite, pyrite, galena and sphalerite with minor chalcopyrite. Tellurides are also noted. Fillis (2000) suggests that arsenopyrite-pyrite mineralisation pre-dates base metal sulphides. Overall sulphide contents are low (<3 vol%). Silver concentrations are low and increase to the south from 8% to 20% (Lim et al, 2001). There is a strong relationship between gold mineralisation and the steeply-dipping faults. The latter were probably active during mineralisation and formed zones of local depressurisation, initiating fluid effervescence and the deposition of quartz-carbonate veins as micrometer-scale lamellae (Bogie, pers comm.). Significantly there is almost no gold mineralisation above the Thrust, even though the high-angle NS and NW-striking faults cut through it. This reflects the strong capping behaviour of the Penjom Thrust and is probably a critical factor in concentrating gold mineralisation. Only discrete late-stage quartz-carbonate-galena veins and even later calcite veins are observed in the hangingwall. At a broader scale, gold mineralisation occurs in lozenge-shaped pods defined by the NS/NW-striking faults, dipping eastward parallel to and beneath the Penjom Thrust. The down-dip extent of mineralisation remains undefined. In summary, high-grade quartz-carbonate-gold mineralisation is related to a phyllic-altered tonalite complex that intrudes weakly metamorphosed fore-arc sedimentary strata in a brittle-ductile transition setting. Penjom, and almost all of the other in situ gold deposits in Peninsular Malaysia, are classified as orogenic lode gold deposits after Groves et al (1988) and are not magmatic arc-hosted epithermal or carbonate-base metal systems as suggested by others (e.g. Kidd, 1998). The discontinuous and small-scale nature of quartz veins make them very difficult to explore and develop. Instead, exploration targets are governed by larger scale controls. Trends within grade control drilling data confirm that these are the NE-striking Penjom Thrust, NS-striking normal faults and NW-striking strike-slip faults. Local lithological controls, such as a tonalite-carbonaceous shale contact, rather than veining itself are the mark of a successful drillhole. This is because the high grade variability can cause a drillhole to be barren, even in an area of high grade mineralisation. The lack of outcrop and a deep lateritised soil profile limits the effectiveness of mapping and trenching as exploration tools. Over the last year, Avocet has applied a number of modern exploration techniques in an effort to identify concealed ore bodies. Multi-element soil geochemistry and IP dipole-dipole geophysics have proven the most effective. B-horizon soil auger geochemical surveys for gold have proven useful, but unreliable. This is because of the supergene enrichment of gold in the soil profile and the subsequent nugget effect. The Exploration Team evaluated the effectiveness of A-horizon partial leach soil geochemistry using the TerraLeach process developed by Genalysis Laboratories in Perth, Western Australia. Orientation surveys over forested and cultivated areas showed that the partial leach technique confirmed the auger gold anomalies and generated a more coherent and reproducible anomaly (this is the subject of a paper to be submitted to the Geological Survey of Malaysia). Partial leach soil geochemistry has become the technique of choice because samples are easy to collect and relatively inexpensive to analyse. The Team now routinely collects partial leach soil samples and analyses them for Au, Ag, As, Sb, Bi, W and Mo. Data to date indicate that Au-Ag-As are anomalous in the footwall of the Penjom Thrust and along NS/NW-striking faults. Sb is anomalous in the hangingwall. Bi-W-Mo tends to occur as "hot spots" over in situ mineralisation. Together these provide a prioritised inventory of drill targets (appendix A – soil anomalies, IP anomalies and targets). IP dipole-dipole geophysics on 1km lines with 50m dipole spacings has proven useful for investigating subsurface geology. Tonalite intrusions are mapped as resistive highs and chargeable lows (> 750Wm and < 10msec, respectively), whereas carbonaceous and sulphide-rich rocks (e.g., graphitic shale in the footwall to the Penjom Thrust) occur as low-resistivity and high-chargeability anomalies (< 200Wm and > 20msec, respectively). This is not fool-proof, but it does provide a third dimension to the targets generated by multi-element soil geochemistry. A 20,000 metres RC and diamond drilling programme is testing eight targets already defined in the immediate mine area. Ongoing exploration is defining additional drill targets. This programme has already identified a significantly mineralised zone to the south of Penjom at Kurnia, which vindicates the exploration approach taken over the last year. The main development initiative at Penjom is a trial underground mining programme to extract ore remaining in the ultimate pit wall and evaluate the efficacy of underground mining. The long-term future of Penjom relies on our ability to exploit potential underground reserves. To assist in this effort, Exploration has commissioned a small seismic survey to map the Penjom Thrust down to 500 metres depth. Deviations in the Thrust structure are primary settings for gold mineralisation and will be tested by a few deep drill holes in order to generate a target for underground development and exploration. Avocet’s operations centre on the Jilau gold mine and its satellites in central western Tajikistan. This is a 49% joint venture with the Tajik Government acquired from Nelson Gold and International Finance Corporation in 2002 The Zeravshan Gold Company joint venture has exploration and mining rights to a 3,000 km2 area containing more than 170 mineral occurrences (figure 3). Since mining commenced in early 1996, the project has produced over 540,000 ounces of gold. Indicated and inferred in situ mineral resources are 29.9Mt @ 1.1 gpt Au (1.01Moz Au). Combined reserves, including stockpiles, are 11.9Mt @ 1.2 gpt Au (0.46Moz Au) (Avocet, 2003). Additional resources are hosted within variably refractory mineralisation at Taror and Chore. These deposits contain measured and indicated resources of 10.8Mt @ 5.4 gpt Au (1.86Moz Au) and 6.5Mt @ 4.4 gpt Au (0.92Moz Au), respectively. The Southern Tien Shan fold and thrust belt provides the regional setting for gold mineralisation in the JV area. This belt also hosts the giant Muruntau and Kumtor gold deposits (figure 4). On a district scale, mineralisation occurs in two distinct EW zones – a southern belt of Sb-Hg±Au rich epizonal orogenic deposits and a northern belt of Au-W±As rich mesozonal intrusion-related mineralisation (figure 3). 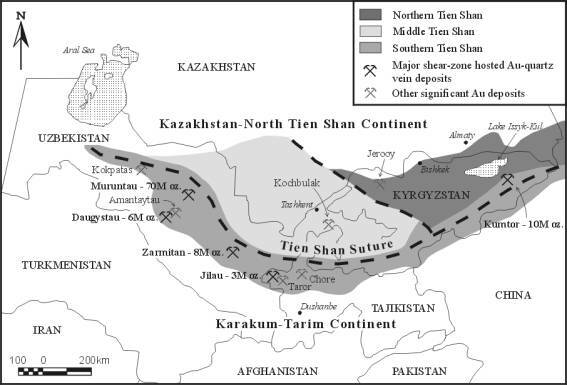 Figure 4: Map of Central Asia illustrating the northern, middle and southern Tien Shan and showing the location of the major gold deposits of the region (after Cole, 2000). Rocks within the Southern Tien Shan fold belt are a regressive marine assemblage ranging from deep marine black shales (late Ordovician) at the base, through thinly-bedded green and red siltstones, platform carbonates (Silurian) and conglomerate and sandstone turbidites (Carboniferous). They occur within EW-striking, north-verging nappes and open asymmetric folds truncated by thrusts. All rocks are regionally metamorphosed to lower greenschist facies. The Chinorsai Intrusion dominates the district geology. It is a composite pluton comprised of granodiorite, quartz monzonite and tonalite. A medium to coarse-grained, equigranular biotite-hornblende-plagioclase-quartz granodiorite is the dominant phase. NE/EW-striking, 1-3km-long porphyritic diorite and olivine-dolerite ("lamprophyre") dykes cut the granodiorite. Aplite dykelets and xenoliths are common in the carapace of the pluton. The intrusion forms an ESE-striking and gently south-dipping pluton some 12 km long and 3 km wide (figure 5). It is located within the core of the EW-striking Chinorsai Anticline. The northern margin is a faulted contact with Neogene fluvial conglomerates. All other wallrocks are Silurian to Devonian, shallow-marine siliciclastic sedimentary rocks and platform carbonates. These rocks are strongly folded and thrusted by the Tien Shan Hercynian Orogeny. The contact with the Palaeogene sequence is clearly intrusive with a thermal aureole several hundred metres wide. Faults, fracture sets and shear zones strike NE, NW and EW and typically dip steeply to the south. Shearing is significant at Jilau where several faults intersect. Cole et al (2000) note that these include EW-striking, high-angle reverse faults; and NW- and NE-striking subsidiary faults. Complicating this is the deposit location within the carapace of the intrusion, where the structural fabric is confused by roof pendents of wallrock. High-angle NE and NW-striking fracture sets and gently south-dipping joint planes are the important structures away from the contact at Jilau North, Olympic and Khirskhona. The pluton is otherwise massive with significant offsets by NW and NE-striking faults up to two kilometres long. Garnet-pyroxene skarns hosting W±Au and Cu-Au mineralisation occur adjacent to the Chinorsai Intrusion in several locations (figure 5). The most significant of these is the Taror ore body. This is five kilometres from the exposed eastern margin of the intrusion, but directly above the granodiorite at depth. Mineralisation is hosted within the contact zone between early Devonian limestone and mid-Carboniferous granodiorite (Carellas, 2002a). Other auriferous tungsten skarns occur in the district, most particularly along the exposed margins of the Chinorsai Intrusion. The Jilau, Jilau North, Olympic and Khirskhona ore bodies are all related to sheeted quartz veins hosted within fracture zones. Most workers (e.g., Carellas, 2002b) infer that the veins are not related to the intrusion, but that faults transecting the intrusion control the distribution of sheeted quartz veins. The main NW-striking Jilau Fault has had a strong influence on the interpretation of the geology and much effort has gone into exploring and developing ore bodies within the NW-striking Jilau Trend. Recent work has identified a continuum of quartz veins ranging from discontinuous, irregular quartz veinlets less than 1cm wide with diffuse unaltered margins (akin to AB- and B-veins in porphyry copper terminology) to straight-walled, through-going, sheeted quartz±sulphide veins. The latter are up to 1m wide, but are usually 2-5cm wide. They either have no discernable alteration selvage or possess a silica-sericite-chlorite alteration selvage as wide as the vein itself. These are akin to D-veins in porphyry copper terminology. Quartz in these veins show evidence of post-vein tectonism (e.g., strained quartz). Later quartz-calcite and calcite only veins also occur. These vein fabrics indicate that quartz veining occurred during the later stages of intrusion. Laboratory studies to investigate this are pending the export of samples. Initial work by Cole (2000) suggests that the mineralising fluid is predominantly magmatic, but also has an important contribution from carbonaceous dolomite wallrocks. He cites high-temperature, low-salinity CO2-CH4 rich fluid inclusions and isotope chemistry, but these data are equivocal. Initial field mapping along the NW Jilau Trend shows that sheeted quartz veins are developed preferentially along NW, NS and NNE-striking, steeply-dipping fracture sets, as well as gently S-dipping joint planes. Post-vein tectonism has also reactivated fractures creating a clean break between the quartz vein and granodiorite wallrock. Rather than being controlled by the NW-striking Jilau Fault itself, sheeted quartz vein mineralisation is developed best where several fracture and joint sets intersect. Consequently, high-grade mineralisation (+3 gpt Au) forms as pod-like shoots with a pronounced NS/NNE trend surrounded by broad haloes of low-grade mineralisation (+0.3 gpt Au). Gold occurs as free grains ranging from 500mm at Jilau to <100mm at Khirskhona (Carrelas, 2002b). It is intimately associated with arsenopyrite and occurs as inclusions within arsenopyrite at depth. Other sulphide minerals include pyrite, tellurides and bismuth minerals. Dzainukov et al (1985) note an early sulphide event at Jilau, which includes chalcopyrite and pyrrhotite. They also note cinnabar and stibnite in late quartz-calcite veins, but this has not been confirmed. Overall sulphide contents are less than 2 vol%. Scheelite is also an important vein phase at Jilau, but is not seen away from the contact. Average gold grades and metallurgical recoveries tend to decrease to the northwest, while ore hardness increases. These observations, together with the south-dipping nature of the intrusion, suggest that there is a definite trend of lower-grade and more difficult metallurgy with depth in the system or distance from the now-eroded granodiorite-wallrock contact (figure 6 – interpreted section). The Jilau Trend deposits, being intimately related to the host Chinorsai Intrusion, fall into the category of orogenic intrusion-related gold deposits of Lang et al (2000) and Groves et al (2002). The most appropriate analogue is the Fort Knox deposit in Alaska (154Mt @ 0.8 gpt Au) and it is notable that the Chinorsai Intrusion is significantly larger than Fort Knox's Vogt Stock. Metals exploration during the Soviet era focused on the discovery and development of tungsten in skarns on the margin of the Chinorsai Intrusion. It was only in the late 1980s that Soviet geologists began to explore for gold hosted by sheeted quartz veins within the Chinorsai Intrusion. They compiled a large database of ground geophysics, soil geochemistry, geological mapping and trench geochemistry. Much of this is locked away in secret files. Since the fall of the Soviet Union, Tajik and British geologists developed the Jilau gold mine. All of the ore is hauled 13km downhill to a twin-circuit mill and CIL/CIP plant. Production has driven further reserve development along the NW trend of deposits and there has been little exploration in the area of interest outside of this trend. The conclusion that the Jilau Trend deposits are intimately related to the Chinorsai Intrusion, rather than post-dating it, has important implications for exploration. The most obvious is that mineralisation is not confined to the Jilau Trend. Indeed there are already walk-up drill targets elsewhere in the Chinorsai Intrusion. The priority for the Exploration Group is to develop high-grade reserves in the immediate mine area. Consequently, Avocet initiated an intensive exploration programme earlier this year. Rather than throw expensive modern exploration techniques at the problem, exploration is taking a more hands-on approach. The Company has engaged the local government geological survey to conduct detailed geological mapping (there is over 60% outcrop), particularly of fracture and vein intensity and alteration mineralogy. This is the best tool for understanding the controls on mineralisation and developing the most effective exploration strategy. The main geochemical prospecting tool is channel sampling of trenches and road cuts across the more fractured and limonite-stained zones. Avocet has recently purchased a high-capacity RC drill rig to assist with our target of drilling 30,000 metres this year. Finally, the Company is pursuing the acquisition of the Soviet-era data. Early results are encouraging. The Exploration Team has defined four prospects outside of the Jilau Trend, the most recently discovered zone being a high-grade pod of mineralisation less than 500 metres west of the Olympic pit. Drilling is still driven by the need to complete the drill out of existing deposits in the Jilau Trend, but the rig will soon focus on assessing the exploration targets within the area of interest. The assessment of dump leaching is a key development project at this time. Early results suggest that low-grade mineralisation (+0.3 gpt Au) yields up to 75% recovery. The Projects Team is constructing a 300,000 tonne test pad ahead of a planned 1Mtpa dump leach operation. If successful, the dump leach operation will expand the amount of mineralisation the Company can bring into reserves. Avocet is confident of unlocking a multi-million ounce gold inventory within the Chinorsai Intrusion. Avocet acquired an 80% interest in the sixth-generation Mongondow Contract of Work in North Sulawesi from Newmont in 2001. 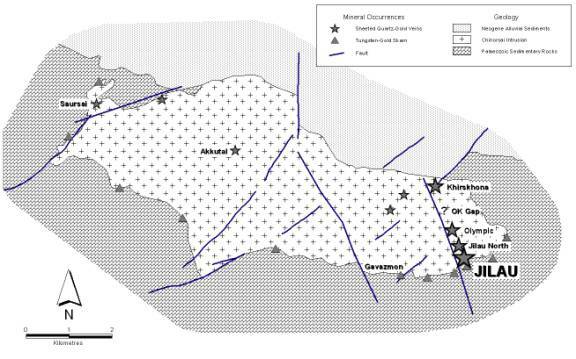 The main asset in the CoW is the North Lanut Gold Project (figure 7 – mineral occurrences, metal belts, location diagram). Avocet has developed measured and indicated resources of 7.95Mt @ 1.7 gpt Au (0.44Moz Au). Inferred resources add a further 3.75Mt @ 1.0 gpt Au (0.11Moz Au). The current reserve is 7.08Mt @ 1.5 gpt Au (0.34Moz Au) (Avocet, 2003). Avocet has completed a bankable feasibility study and is in the process of obtaining all necessary permits and employing the project construction team. Production is scheduled to commence in the second half of 2004. Neogene volcanic rocks dominate the geology of North Sulawesi. These rocks reflect the episodic evolution of calc-alkaline island arc volcanism from a submarine to subaerial environment. As such, the Neogene stratigraphy records phases of explosive volcanism, erosion and deposition of volcanic detrital material and carbonate rocks, and intrusion of subvolcanic magmas. Two Neogene arc events have been identified, superimposed on an emergent-arc basement of basalt lavas and deep marine sedimentary rocks (Carlile et al, 1990; Kavalieris et al, 1992; Soeria-Atmadja et al, 1999; and Pearson and Caira, 1999). Both arcs are related to subduction along the south-dipping North Sulawesi Trench, although later volcanism may also derive from west-dipping subduction along the Sangihe Trench. Miocene arc volcanism is represented by extensive sequences of andesite lava, lahar and pyroclastic rocks of the Bilungala Volcanic Formation. Reworked volcaniclastic sedimentary rocks and minor limestone are intercalated within this formation. The Miocene arc is also represented by a number of diorite, quartz diorite, and granodiorite stocks. The second arc event is Plio-Pleistocene in age. It is represented by laterally discontinuous sequences of dacite to rhyodacite pyroclastic rocks, subvolcanic intrusions and diatreme breccias. An evolving sedimentary succession has accompanied the development of island arc volcanism. These rocks include volcanic conglomerate, volcaniclastic sedimentary rocks and massive platform carbonate sequences. Nanofossil ages suggest essentially continuous sedimentation flanking the stratovolcanoes of the island arc throughout the Neogene. In many cases, sedimentary strata are intercalated with the volcanic sequences. The northeastern “limb” of North Sulawesi is punctuated and covered by Pleistocene to Recent andesite-dacite volcanic activity related to subduction along the west-dipping Sangihe Trench. The NW-striking Inobonto Fault dominates the geology of the North Lanut Project. It forms a 30-km long, 4-km wide corridor encompassing several gold targets, collectively known as the Lanut Corridor. This is a major arc-transverse strike-slip fault that appears to have been active through the two separate subduction events and has evidence for both dextral and sinistral (latest) displacements. NE and NS-striking dilational tears within the Inobonto Fault localise the best mineralisation. The Fault cuts through a late Miocene basal sequence of shallow marine platform limestone and calcareous, volcaniclastic mudstone, siltstone and sandstone. This is overlain by a Pliocene sequence subaerial pyroclastic rocks that includes andesite to dacite crystal-lithic tuff, tuff breccia and isolated fluvially-reworked volcanic sandstone and siltstone. This is the dominant unit in the project area. It is known informally as the Lanut Sequence (Flindell and Garcia, 2000). A series of diorite and dacite plugs punctuate the late Miocene-Pliocene stratigraphy, particularly along the northeast flank of the Inobonto Fault. Pleistocene-Recent dacite ash-crystal tuffs blanket the northeastern margin of the Inobonto Fault and cover a significant portion of the North Lanut Project. They derive from the nearby dormant Ambang volcano and Moat caldera; and most commonly occur as a thick red feldspar-rich soil. The dacite ash sequence post-date mineralisation. The North Lanut Project is part of a larger hydrothermal system known as the Lanut District (figure 8 – district map). This is a 7 x 9 kilometre area that includes both high- and low-sulphidation epithermal gold deposits, porphyry-copper mineralisation and an active metal-rich hot spring system. Perhaps the best known deposit in the area is the low-sulphidation epithermal quartz vein system at Lanut. This has been the focus of intense local mining activity over the past twenty years and has a history of mining dating back to the 1850s. A Placer Dome-BHP-Aneka Tambang joint venture identified a drill inferred resources of 5.5Mt @ 2.8 gpt Au in the late 1980s. The Riska deposit is the most significantly mineralised target in the North Lanut Project. This is a small, Yanacocha-style high-sulphidation system approximately 400 long and 200 metres wide that occupies an EW-oriented ridge. Drilling has identified one main cell of pervasively silica-pyrite altered tuffaceous rocks and two subsidiary cells. Alteration zones out through intense kaolinite to successively weaker illite-smectite and chlorite-smectite alteration. Each silicified zone is cut by strike and dip persistent silica-enargite-luzonite±covellite altered hydrothermal breccia and fracture zones up to 20 metres wide and enveloped by later intense alunite alteration. The alunite event is critical to the economics of the project, as it forms an oxidised cap that extends down to 100-150 metres depth (most of it in a transition ore zone). Geologists have identified two main phases of gold mineralisation. These are an early low-grade event (<0.5 gpt Au) related to the initial silica-pyrite alteration and a later high-grade event (5-100 gpt Au) related to the silica-enargite-luzonite breccia and fracture zones. There appears to be minimal remobilisation of gold with the hypogene alunite (oxidation) event. K/Ar dating of the alunite at Riska yielded ages of 2.09±0.08Ma (White, 2000), confirming suspicions that the high-sulphidation systems at North Lanut are very young (late Pliocene). A smaller oxidised high-sulphidation deposit occurs at Effendi-Rasik. This is a stratigraphically-controlled zone covered by a blanket of mineralised boulders and Recent dacite ash tuff. Limited drilling has defined a smaller inferred resource, but this has not yet been converted into a reserve. Avocet has conducted only limited exploration in the Lanut District. This is because of priorities elsewhere in the Company, but also because a comprehensive exploration database already exists courtesy of Newmont. This includes geological mapping, ground geophysics (magnetics and IP) and B-horizon soil auger sampling (geochemistry and PIMA analyses). Avocet has extended the soil and IP surveys. Hydrothermally-altered areas show as magnetic low terrain, but the more significant targets (e.g., Riska and Effendi) occur as resistive and chargeable anomalies (> 750Wm and 10msec, respectively). Low-sulphidation epithermal veins have weaker anomalous signatures (appendix B – IP and soil anomalies). The soil data maps high-sulphidation epithermal gold mineralisation as a strong Au-As-Sb-Hg-Pb anomaly coincident with a negative Zn anomaly. The soils also contain abundant alunite±pyrophyllite±dickite (appendix B). Unfortunately, this is not useful in areas covered by Recent dacite tuff (as the Exploration Team has proved with some barren scout drillholes). The Company is currently evaluating the effectiveness of partial leach soil surveys using Genalysis’ TerraLeach technology. North Lanut is Avocet’s new development project. The Company has successfully evaluated a 1.5Mtpa dump leach operation that will generate approximately 50,000 ounces of gold per annum. Production is scheduled to commence in the second half of 2004. Avocet’s gold operations encompass a diverse array of projects ranging from Permian intrusion-related orogenic gold deposits in Tajikistan to Neogene epithermal gold mineralisation in Indonesia. This presents an exciting challenge to the Exploration Team, not the least of which is understanding the mineralisation controls of each deposit style and tailoring exploration programmes accordingly. This is especially critical given the corporate goal of becoming a 300,000 ounce per annum producer and the obvious capacity of existing projects to meet this goal. It is early days in Tajikistan, but geological mapping and trenching has already discovered new gold prospects. The Company is very excited about the multi-million ounce potential of the unexplored Chinorsai Intrusion. Time spent to understand the Penjom deposit and apply more sophisticated exploration techniques has paid off with the discovery of a potential satellite orebody at Kurnia. Finally, low-key exploration is building on a comprehensive database at Mongondow and will accelerate into a resource delineation phase once production commences. Exploration is a team effort. The author acknowledges the continuing contributions of the current Exploration Team and also the efforts of previous geoscientists. In particular, the author thanks Phil Fillis for his excellent work at Penjom and management for their support in presenting this work. Bogie, I.; 2002; Petrology report on 15 samples from the Penjom Gold Mine, Malaysia; Internal Report for Specific Resources Sdn. Bhd. Cole, A., Wilkinson,J.J., Halls, C. and Serenko, T.J.; 2000; Geological characteristics, tectonic setting and preliminary interpretations of the Jilau gold-quartz vein deposit, Tajikistan; Mineralium Deposita, Vol. 35, No. 7, p 600-618. Davies, H.; 2000; The Penjom-Malaysia remote sensing project; Internal Report for Specific Resources Sdn. Bhd. Fillis, P; 2000; Penjom resource model; Internal Report for Specific Resources Sdn. Bhd. Kidd, R.; 1998; Exploration, geology, mineralisation and resource estimate of the Penjom Gold Mine; Internal Report for Specific Resources Sdn. Bhd.